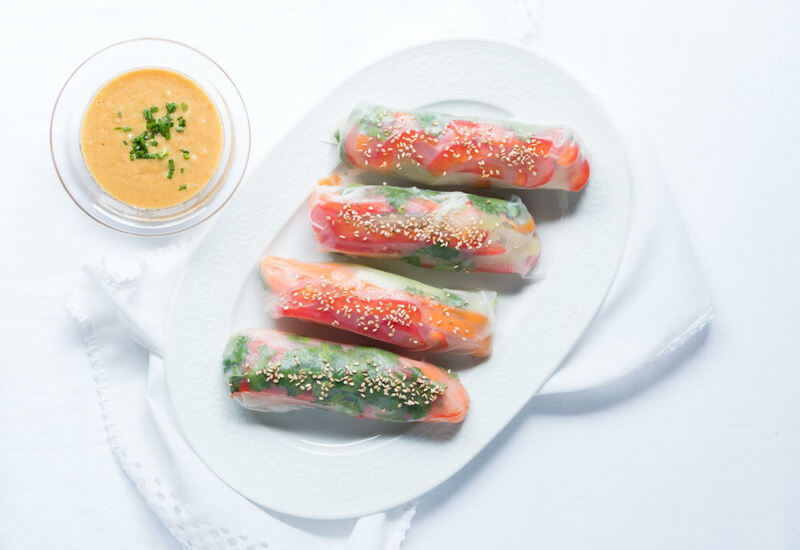 These vegetable spring rolls are a sneaky way to eat your veggies! Make sure to not skimp on the peanut sauce; it’s killer! To make these vegan, substitute soy sauce for the fish sauce. Per Serving: 395 calories; 20g fat; 48.8g carbohydrates; 10g protein; 0mg cholesterol; 422mg sodium. Full disclosure: I poached some shrimp and added them to the rolls. I love spring rolls. I am not sure why the gimmick of them will get my boys to eat food at which they'd otherwise scoff, but they will. Might have to start putting everything in rice paper wrappers. You can probably riff a bit on the rolls themselves. The star of this recipe is the dipping sauce. It's pretty good. Just go for it. The flavor is way more than you'd think from reading the ingredients list. Trust me. THIS SAUCE! Even if you're too intimidated to make the spring rolls, make this sauce and just dip everything in sight into it! Veggies, chicken kebabs, your fingers! Seriously, so delicious. I didn't have molasses so I omitted completely and had no issues.